This method allows characterization of extended bacterial co-culture with EpiAirways, primary human respiratory epithelial tissue grown at the air-liquid interface, a biologically relevant in vitro model. The approach can be used with any microbe that is amenable to long-term co-culture. Ren, D., Daines, D. A. Use of the EpiAirway Model for Characterizing Long-term Host-pathogen Interactions. J. Vis. Exp. (55), e3261, doi:10.3791/3261 (2011). Nontypeable Haemophilus influenzae (NTHi) are human-adapted Gram-negative bacteria that can cause recurrent and chronic infections of the respiratory mucosa 1; 2. To study the mechanisms by which these organisms survive on and inside respiratory tissues, a model in which successful long-term co-culture of bacteria and human cells can be performed is required. We use primary human respiratory epithelial tissues raised to the air-liquid interface, the EpiAirway model (MatTek, Ashland, MA). These are non-immortalized, well-differentiated, 3-dimensional tissues that contain tight junctions, ciliated and nonciliated cells, goblet cells that produce mucin, and retain the ability to produce cytokines in response to infection. This biologically relevant in vitro model of the human upper airway can be used in a number of ways; the overall goal of this method is to perform long-term co-culture of EpiAirway tissues with NTHi and quantitate cell-associated and internalized bacteria over time. As well, mucin production and the cytokine profile of the infected co-cultures can be determined. This approach improves upon existing methods in that many current protocols use submerged monolayer or Transwell cultures of human cells, which are not capable of supporting bacterial infections over extended periods3. For example, if an organism can replicate in the overlying media, this can result in unacceptable levels of cytotoxicity and loss of host cells, arresting the experiment. The EpiAirway model allows characterization of long-term host-pathogen interactions. Further, since the source for the EpiAirway is normal human tracheo-bronchial cells rather than an immortalized line, each is an excellent representation of actual human upper respiratory tract tissue, both in structure and in function4. For this method, the EpiAirway tissues are weaned off of anti-microbial and anti-fungal compounds for 2 days prior to delivery, and all procedures are performed under antibiotic-free conditions. This necessitates special considerations, since both bacteria and primary human tissues are used in the same biosafety cabinet, and are co-cultured for extended periods. Wearing a dedicated lab coat, with hair tied back and gloves on, start the laminar flow. After 5 minutes, move any tools in the cabinet (pipettors, tips, centrifuge tubes, etc.) to one side, spray the biosafety cabinet interior and sash with 70% ethanol and wipe down with clean paper towels. Spray the cleaned interior again with 70% ethanol and leave to dry. Move the tools to the clean side and repeat the ethanol procedure. Use aerosol barrier pipette tips and dedicated pipettors in the cabinet. To use individually-wrapped sterile serological pipettes, pass the plugged end through the laminar flow, break open, and slide the pipette into the cabinet, discarding the packaging outside. The EpiAirway inserts must be handled with sterile forceps. Place 6-inch fine-tip curved dissecting forceps into self-sealing sterilization pouches and autoclave. Prepare enough to have at least six per day ready for use. Spray the work surface in the biosafety cabinet with 70% ethanol and wipe down with clean paper towels. Spray again and allow the surface to dry prior to use. Open the EpiAirway box and discard the Styrofoam and packing material. The EpiAirway antibiotic-free maintenance media, AIR-100-MM ABF (MM), is proprietary to MatTek and is sent in the kit with the inserts. In the biosafety cabinet, label six sterile 50 ml centrifuge tubes with the media type and date, and loosen the caps. Spray the media bottle with 70% ethanol and open inside the cabinet. Aliquot 25 ml of MM into each tube using a new sterile serological pipette for each tube, tighten the caps, and store at 4°C. Use a fresh aliquot of MM each day. Repeat 2.2 above using a fresh bottle of 1 X Dulbecco's phosphate-buffered saline (D-PBS) with calcium and magnesium. Repeat again using D-PBS without calcium and magnesium. Store all aliquots at 4°C. The EpiAirway inserts AIR-100 arrive in a 24-well plate at 4°C on solid media-containing agarose, and must be placed into 6-well plates for use. Label each plate with the date and description using an ethanol-resistant marker. Place 1 milliliter of 4°C EpiAirway MM into each well. Remove the transport plate from its packaging, spray with 70% ethanol, and place in the biosafety cabinet. Remove the tape and open the plate. Using autoclaved forceps, remove the damp gauze over the EpiAirway inserts. Pick up an insert with autoclaved forceps using a twisting motion to aid in releasing it from the agarose, and place into a well of a 6-well plate. Some agarose may adhere to the insert, particularly as the temperature of the transport plate increases to ambient. Use a sterile cotton swab to carefully remove the agarose from the insert. Avoid touching the membrane, and check that no air bubbles are trapped beneath the inserts. Place the plate into a humidified 37°C incubator with 5% CO2. Allow at least 24 hours for the tissues to equilibrate in the incubator before starting co-cultures. Using autoclaved forceps, pick up an insert and gently pipette 200 microliters of pre-warmed D-PBS with calcium and magnesium onto the tissue and rock the insert. Tilt the insert at an angle and place your sterile P1000 pipette tip against the plastic ring that holds the membrane at the bottom of the insert. Do not touch the tissue. Aspirate the D-PBS rinse and place into a labeled sterile cryovial. Samples can be frozen at -20°C and assayed for mucin and/or cytokine expression at a later date. Change the basal MM daily by aspirating and replacing with 1 milliliter of fresh MM. Use a new barrier pipette tip for each well. Treat the used media with 10% bleach overnight and discard. Streak out a fresh culture of nontypeable Haemophilus influenzae (NTHi) from frozen glycerol stock onto chocolate agar. Grow overnight in a humidified 5% CO2 incubator. The next day, resuspend single colonies of NTHi in pre-warmed D-PBS with calcium and magnesium to an OD (600 nm) of approximately 0.7. Vortex vigorously prior to measuring the optical density. The relationship of optical density to colony-forming units per ml (CFU/ml) of NTHi is that an OD (600 nm) of 0.2 approximately equals 1.0 x 108 CFU/ml. Therefore, an OD (600 nm) of 0.7 is about 3.5 x 108 CFU/ml. This algorithm should be validated for each NTHi strain prior to inoculation. The EpiAirway tissues AIR-100 are grown on inserts with a surface area of 0.6 cm2 and a 0.4 micron membrane. The tissues are composed of ~8.0 x 105 to ~1.0 x 106 cells. Therefore, an inoculation of 1.0 x 107 CFU corresponds to a multiplicity of infection of about 10 - 12. To inoculate, rinse each EpiAirway insert as in 3.1, then add 28 microliters of the bacterial suspension prepared in 4.2 to the apical surface of each EpiAirway insert in the biosafety cabinet. Do not inoculate the basal MM. Return each plate to the incubator. Prepare a phosphate-buffered saline (PBS) solution with 0.1% gelatin (PBS-G), autoclave to sterilize. Label sterile 1.5 ml Eppendorf tubes with the desired 1:10 dilutions based on the OD (600 nm) of the inoculum and aliquot 900 microliters of the sterile PBS-G into each tube. Determine the number of chocolate agar plates required to enumerate the inoculated NTHi. Place these plates in an air incubator upside down with the bottom of the plate resting on half of the top for one hour. This will allow the plate to both warm to 37°C and the surface to dry, facilitating the drop-plating of NTHi. Start the serial 1:10 dilutions of the inoculum by adding 100 microliters of the bacterial suspension from 4.2 to the first tube. Vortex each dilution vigorously for 5 seconds prior to making the next. Drop 10 microliter aliquots onto the pre-warmed and surface-dried chocolate agar plates, using half the plate for each dilution. Five to six 10 microliter aliquots can fit on one half of each 100 mm plate without running together. When dry, place upside down in a humidified 37°C CO2 incubator overnight. The next day, determine the CFU/ml by counting the dilutions that have 15-30 distinct colonies in each drop and calculating back to your actual viable inoculum of NTHi. Every 24 hours, wash the inserts as in 3.1, then pool the washings of each tissue that has been inoculated with the same strain of bacteria and freeze at -20°C in a labeled cryovial for future analysis. These samples can be assayed for the presence of mucin by dot blots or for the expression of cytokines by ELISA. Alternatively, tissues can be harvested for mRNA and qPCR can be performed on genes of interest. Change the basal MM daily as in 3.2. Continue for the duration of the co-culture. Prepare a fresh 1% solution of saponin in D-PBS without calcium and magnesium, filter-sterilize and warm to 37°C. Warm a 50 ml tube of MM and another of D-PBS without calcium and magnesium to 37°C. Prepare dilution tubes as in 5.1, as well as one empty sterile 1.5 ml Eppendorf tube per insert, labeled with the insert number and NTHi strain. The EpiAirways can be harvested for either total cell-associated bacteria, which includes both adherent and internalized organisms, or for internalized bacteria only. Determine the number of chocolate agar plates needed to drop-plate the cell-associated or invaded NTHi, label and dry for one hour in an air incubator as in 5.2. To harvest total cell-associated bacteria, rinse the apical surface of the EpiAirways three times with 200 microliters of D-PBS without calcium or magnesium, then tilt the insert and rinse any remaining MM from the basal membrane. The first wash can be frozen for later analysis; discard the following washes. Place the washed insert in a fresh 6-well plate without MM, and pipette 250 microliters of the sterile 1% saponin solution from 7.1 onto the apical surface of each tissue. Return to the incubator for 10 minutes. Remove from the incubator, and using a sterile P1000 pipette tip, scrub the tissues from the membrane using a back-and-forth motion, followed by a circular motion to remove the tissue from the edges of the insert. Using a large-bore sterile P1000 pipette tip, place the suspension into the empty labeled tube prepared in 7.3. Add 250 microliters of D-PBS without calcium or magnesium onto the apical surface of the insert. Examine the insert using an inverted phase-contrast microscope to determine if there is any remaining tissue to be harvested. If needed, scrub again with another sterile P1000 pipette tip, then add this suspension to the tube from 7.8 using a large-bore sterile P1000 pipette tip. Bring the total volume of the tube to 1 milliliter using D-PBS without calcium or magnesium. Vigorously vortex the cell suspension at top speed for one minute. Using a sterile 1 ml syringe fitted with a 26 gauge needle, aspirate the suspension into the syringe through the needle. Slowly pass the suspension through the needle 3 times, taking care not to create bubbles. Vortex vigorously again for one minute. Using a large-bore pipette tip, place 100 microliters of the suspension into the first dilution tube prepared in 7.3. Vortex vigorously for five seconds, then make serial 1:10 dilutions. Drop-plate the desired dilutions onto the surface-dried chocolate agar plates. To harvest internalized bacteria only, wash each insert 3 times with 200 microliters of D-PBS without calcium or magnesium. Retain and freeze the first wash. Add gentamicin sulfate to pre-warmed MM to a final concentration of 100 micrograms/ml. Prepare 1.5 ml of media per insert to be harvested. Replace the basal MM with the gentamicin-containing MM, and add 300 microliters of gentamicin-containing MM onto the apical surface. Place the plate back into the CO2 incubator for one hour. Remove the gentamicin-containing MM from the apical surface and wash the apical surface and basal membrane of the insert extensively with pre-warmed D-PBS without calcium and magnesium. Proceed as in 7.7-7.11. Scanning electron micrographs of (A.) uninfected EpiAirway tissue and (B.) 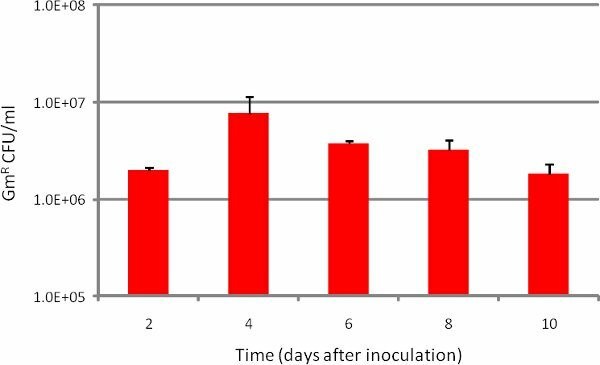 tissue after a 5-day co-culture with NTHi are shown in Figure 1. Long-term co-culture with NTHi does not result in significant damage to the apical tissues, underscoring the utility of the EpiAirway model. A graph depicting the number of internalized bacteria quantified over time inside tissues is shown in Figure 2. Both results are quite reproducible, making the EpiAirway tissues a consistent and biologically relevant in vitro model of the human upper airway in which to study NTHi host-pathogen interactions. Figure 1. Scanning electron microscopy of EpiAirway tissues. A. Uninfected control tissue. B. Tissue after five days of co-culture with NTHi. No significant damage to the apical surface is observed in the infected tissues. Figure 2. Number of NTHi internalized over time during EpiAirway co-culture. Strain R2866 was inoculated at approximately 1.0 x 107 CFU/insert (Day 0), then harvested for internalized bacteria at each indicated time point. Bars represent n=3 replicates in at least duplicate. Error bars are SD. This method allows the investigation of long-term host-pathogen interactions in a biologically relevant background of primary human respiratory tissues at the air-liquid interface. Here we have used NTHi as the infecting organism, but the interaction of any bacterium that does not introduce unacceptable cytotoxicity over time can be quantified with this method. The EpiAirway model can also be used for the study of viruses, drugs, or chemicals that impact the human upper airway5; 6; 7; 8. We have maintained uninfected tissues for more than 40 days, and tissues infected with NTHi for at least 10 days. We expect that infected tissues could be maintained for significantly longer, if desired. The limitations of this method are similar to that of any in vitro model, including the inability to reconstitute a competent immune system in these tissues. Although daily washes of the tissues are performed to mimic normal mucociliary clearance, establishing a natural outlet for the mucin produced in these tissues would be more desirable9. Further, contact with NTHi is known to induce mucin expression in human respiratory epithelial cells, exacerbating the problem10. On the other hand, the daily EpiAirway washes can be saved and assayed for proteins or enzymatic activities of interest, adding an important dimension to the method and increasing its usefulness. One key step in the successful performance of this method is the mechanical disruption of the tissues prior to drop-plating the NTHi (step 7.10). Because the EpiAirways are highly differentiated and composed of multiple cell types, the tissues are not as easy to disintegrate as a cell monolayer, even after saponin treatment. In addition, NTHi are notoriously sensitive to compounds that aid in the disaggregation of tissues. Therefore, we have found that passing the cell suspension through a 26 gauge needle greatly improves our ability to generate consistent and repeatable quantification of internalized or cell-associated bacteria. Once this technique is mastered, it can also be utilized to investigate the relative ability of mutant bacterial strains to survive as compared to their wild-type parents, allowing the investigator to characterize the effects of specific genetic mutations. We would like to thank Patrick Hayden (MatTek) for helpful discussions, and Robert Smith and Libby Perry of Georgia Health Sciences University for their EM skills. This study was funded by NIDCD grant DC010187 to D.A.D. Murphy, T. F., Apicella, M. A. Nontypeable Haemophilus influenzae: a review of clinical aspects, surface antigens, and the human immune response to infection. Rev. Infect. Dis. 9, 1-15 (1987). Murphy, T. F., Faden, H., Bakaletz, L. O., Kyd, J. M., Forsgren, A., Campos, J., Virji, M., Pelton, S. I. Nontypeable Haemophilus influenzae as a pathogen in children. Ped. Infect. Dis. J. 28, 43-48 (2009). Hotomi, M., Arai, J., Billal, D. S., Takei, S., KIkeda, Y., Ogami, M., Kono, M., Beder, L. B., Toya, K., Kimura, M., Yamanaka, N. Nontypeable Haemophilus influenzae isolated from intractable acute otitis media internalized into cultured human epithelial cells. Auris Nasus Larynx. 37, 137-144 (2010). Chemuturi, N. V., Hayden, P., Kalausner, M., Donovan, M. D. Comparison of human tracheal/bronchial epithelial cell culture and bovine nasal respiratory explants for nasal drug transport studies. J. Pharm. Sci. 94, 1976-1985 (2005). Sharma, M., Schoop, R., Hudson, J. B. The efficacy of Echinacea in a 3-D tissue model of human airway epithelium. Phytother. Res. 24, 900-904 (2010). Sexton, K., Balharry, D., BeruBe, K. A. Genomic biomarkers of pulmonary exposure to tobacco smoke components. Pharmacogenet Genomics. 10, 853-860 (2008). Babu, R. J., Dayal, P., Singh, M. Effect of cyclodextrins on the complexation and nasal permeation of melatonin. Drug Deliv. 6, 381-388 (2008). Balharry, D., Sexton, K., BeruBe, K. A. An in vitro approach to assess the toxicity of inhaled tobacco smoke components: nicotine, cadmium, formaldehyde and urethane. Toxicology. 244, 66-76 (2008). Fahy, J. V., Dickey, M. D. Airway mucus function and dysfunction. N. Engl. J. Med. 363, 2233-2247 (2010). Huang, Y., Mikami, F., Jono, H., Zhang, W., Weng, X., Koga, T., Xu, H., Yan, C., Kai, H., Li, J. -D. Opposing roles of PAK2 and PAK4 in synergistic induction of MUC5AC mucin by bacterium NTHi. 359, 691-696 (2007).